1. The Club shall be called the Capel Ladies Club of Capel St Mary and membership shall be open to all women over the age of 18. 2.3 carry out fund-raising for charities. 3. The Capel Ladies Club shall be managed by a General Committee comprising a minimum of 6 members. Their role is to manage the affairs of the Club, arrange the time and place of meetings, outline the programme of events and present it to Club members, and administer the funds of the Club in consultation with Club members. 4. The Officers of the Committee shall consist of the Chairlady, Treasurer, Secretary and two Programme Secretaries. These Officers shall be elected by a majority of the Club members voting at the AGM, and appointed at the first meeting of the Committee following the AGM. All members of the Committee shall be elected to serve for two years, after which they retire for at least one year. Any Committee member will be given the option to remain on the Committee for a further year if they so wish, and they must then retire for a minimum of one year thereafter. The Committee may decide to combine any of the offices. 5. A quorum of the General Committee shall be three (half), or half of the Committee members (rounded up) if that is greater than three. The Committee may fill vacancies and co-opt additional Committee members as required as long as there is always a majority of elected Committee Members. These new Committee Members may serve until the next AGM. All Committee members, whether co-opted or elected must be full Members of Capel Ladies Club. 6. The Minutes of all Committee meetings shall be kept and shall be available at each meeting for confirmation by the General Committee. 7. 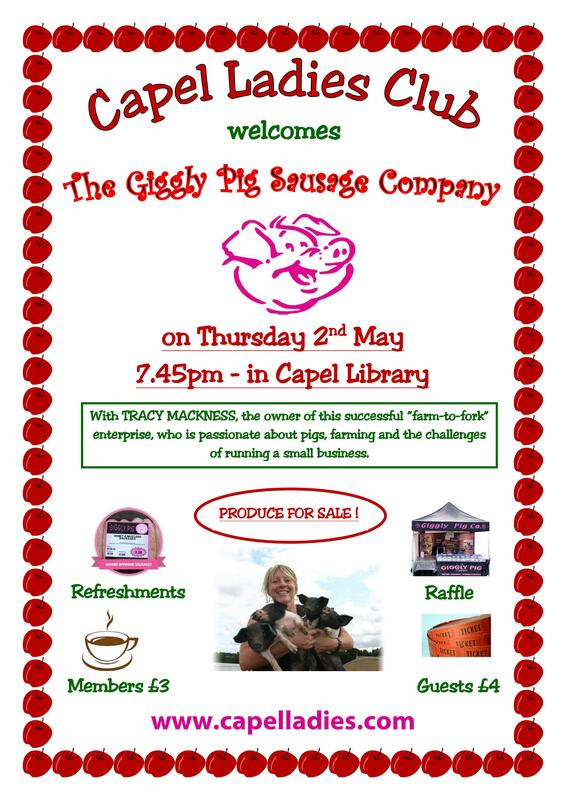 Capel Ladies Club Meetings are generally held every first Thursday in the month, and Outings on the third Thursday wherever possible, with the exceptions of the months of January, when the only Meeting is the AGM, and August, when there is no Outing. The General Committee reserves the right to amend this arrangement as it sees fit. 9. Nominations for the Committee may be made by any Club Member to any Committee Member in advance of the AGM. The Chairlady shall read the list of all nominations at the AGM for the Club Members to vote upon. 10. Members may join Capel Ladies Club by paying the required Annual Subscription. Subscriptions shall be as follows:- Full membership £6.00 (£3 for anyone joining after the Summer break) payable at the first meeting attended after the AGM. At each “In” Meeting members pay a fee of £2, Guests £3 per session. 11. Non-members may attend a Capel Ladies Club meeting as visitors, and shall pay the current agreed guest rate. After attending two meetings in any calendar year they shall be required to become full Club members. 12. Members and guests of Capel Ladies Club must agree that they attend “In” meetings and Outings at their own risk and shall not hold Capel Ladies Club responsible in any way for any liability, claim or loss suffered to the fullest extent permissible by English law. 13.1 Keep proper records of accounts and have them audited annually by 31st December for presentation at the AGM in January each year, for formal adoption by members. If possible an auditor should be appointed for the following year. 13.2 Report at each committee meeting on any money held/amounts in the bank account and expenditures. 13.3 Provide a copy of these figures to the Secretary at each committee meeting. 13.4 Bank monies as soon as possible after Capel Ladies Club meetings. An agreed amount of £150 petty cash can be held to service forthcoming events or out-of-pocket expenses, or drawn nearer the required meeting dates. Petty cash transactions are to be signed for by all receivers and dated. 14. The Committee of Capel Ladies Club should maintain enough funds in the Bank or Building Society to cover Speakers’ fees, hire of Hall and petty cash for the following year. 15. There should be four cheque signatories, two of which must be committee members, but not necessarily the Treasurer, the other two being committee members or Capel Ladies Club members. Any two signatories may sign for withdrawal by either cash or cheque. 16. Any equipment bought for the Club’s use is to be maintained and kept safe for the use of Capel Ladies Club and members. 17. When there are changes to the committee all records must be handed over to incoming committee members. Guidance on storage of records and continued support for a smooth transfer of responsibilities will be provided by the outgoing committee. 18. This Constitution will be kept under review by Capel Ladies Club and may be altered at an AGM by a resolution passed by two-thirds of the votes cast by Club Members attending that meeting. 19. In the unlikely event that Capel Ladies Club should cease to function for any reason, after a reasonable time has elapsed, any remaining funds or assets should be donated to a Capel village charity or group, which could include a church or school, either in its entirety or shared, to be agreed by the Members before the Club is dissolved. The retiring Committee must provide up-to-date audited accounts before it is disbanded.